It's Fox's golden month birthday! 14 months old on the 14th of the month! 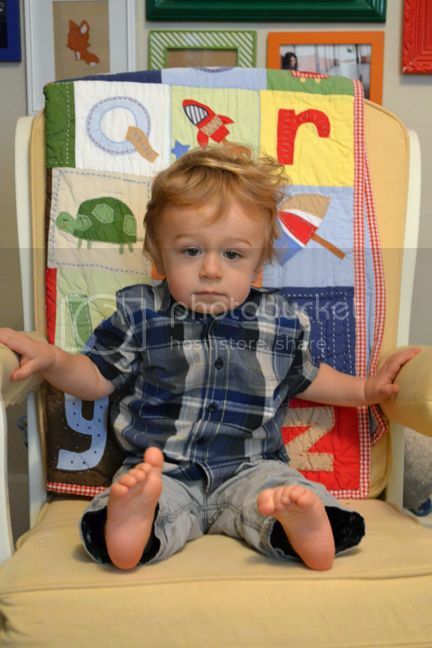 As soon as he woke up from his nap today we took his 14 month pictures... sleepy much? Queue cats meowing and dogs barking (also known as parents making obnoxious noises to get their kid to smile) - hey, it works! We love that Fox can walk. It makes him seem like such a little grown up to have him meandering all around the apartment and he goes wherever he wants to go. He's a little person! We're still boggled that we're parents and we are to Fox what our parents are to us, if that makes sense. It's been pretty cold outside lately but when we do venture outdoors the first thing he does is find a pair of leaves. He's O.B.S.E.S.S.E.D. with leaves! Why must he walk with them? Hopefully he can tell us one day. 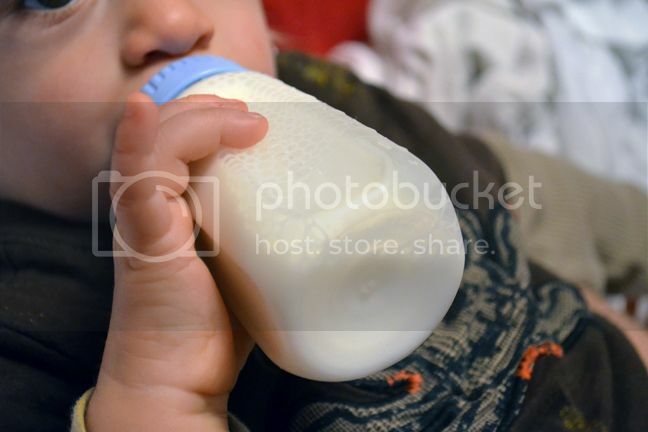 When he drinks his bottle he lifts his pinkie finger like a little gentleman. Fox has a built in radar that finds water of any kind - puddles, rivers, creeks, what have you. All he wants to do is splash and play in the water! Not to mention he's always running into things. He needs whiskers like cats or something. Fox gets his groove thang on now whenever music plays. He bounces up and down and bends his knees all cutely. I didn't even know knees could be cute! But Fox proves they definitely are. Occasionally Fox walks backwards when he's being shy or cautious. It's the funniest thing to behold. He slowly, timidly, takes a step back. Then another step. Then another. Other times he spins in circles. He's learning how to use his feet in more ways than just forward motion. Sleeping and eating habits are about the same from last month. He might be phasing out his morning nap. He goes a few days without one then takes it again for a few days. Afternoon naps are still in full swing though. Naps are good. Fox can climb up and down from the couch! It's amazing that in just 14 short months he went from a helpless being to a full-fledged boy capable of so many things. One thing is for sure - he's a handsome little boy! Happy 14th on the 14th my little man! Can Fox get any cuter?? I think not!! He is growing up so fast!! 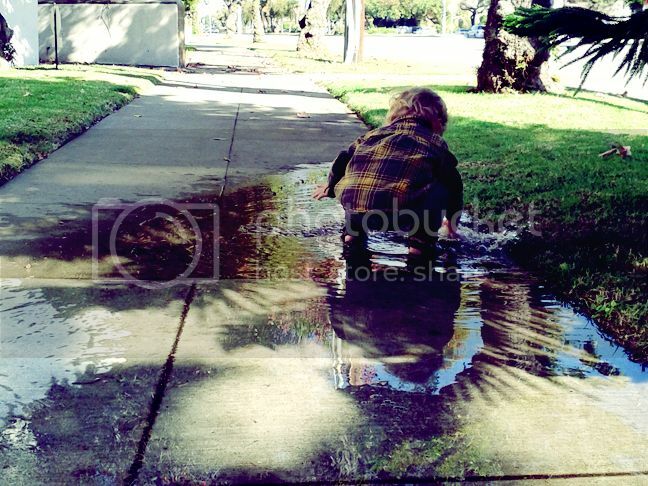 I really love the picture of him with the puddle!! And the last one! Love that last pic! Totally looks like a Ralph Lauren ad!!! that last picture of fox get's me every time. and i have noticed those tantrums, they are intense. and those little bouncy legs to music is perfect!!!!! I totally understand the walking backwards. When Lou (18 months) does it, it always make me crack up. OHHHH! I just love him--I wish I could hug him!!! I love the first photo of him sleepy and then the laughing one right after (love that you were making noises to get him to giggle!! SOOO cute)!!! How many teeth does he have now? Ev's looking forward to seeing her cousin next week! Could he possibley get any cuter! Happy 14 months! Happy 14th on the 14th Fox. You are cute, cute, cute. That last picture kills me!! What a stud! You have a sweet little future heart breaker on your hands my friend. I am just in love with that 'just woke up' face!! 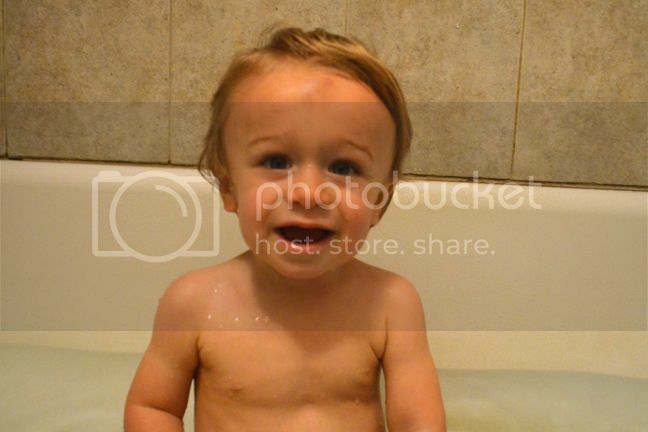 He is too cute....I couldn't imagine him throwing a huge tantrum!! Although I have worked in daycare for 7 years so I know that looks can be deceiving!! Oh my, he is the cutest. My kids also banged their heads on the floor when they had their tantrums. I just held them and told them that i understood they were angry but that I wouldn't change my mind and that I would hold them until they felt better and to make sure they wouldn't hurt themselves. yes, sadly tantrums are normal, my little guy can scream to the point where nothing comes out of his mouth and he looks like he'll stop breathing...ugh...love that waking up pic, just too adorable!! happy 14th month fox!! sigh. i miss fox! I totally remember his little tantrums where he'd hit his head on the ground. I love that he can walk backwards! oh, and that last picture looks like a baby model. Cutest boy ever! 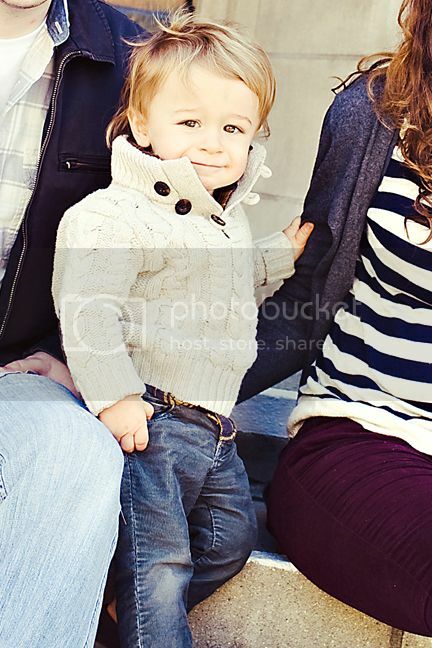 That boy sure knows how to pull a GQ pose! he is so perfect and cute! He is growing wayyy too fast! 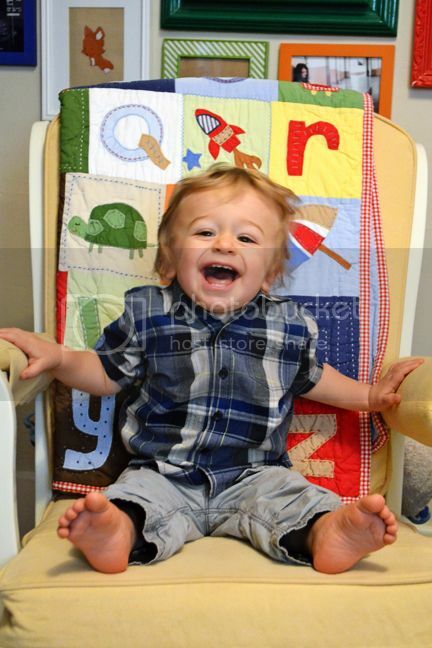 omgosh, he is such a stud muffin in that last picture! 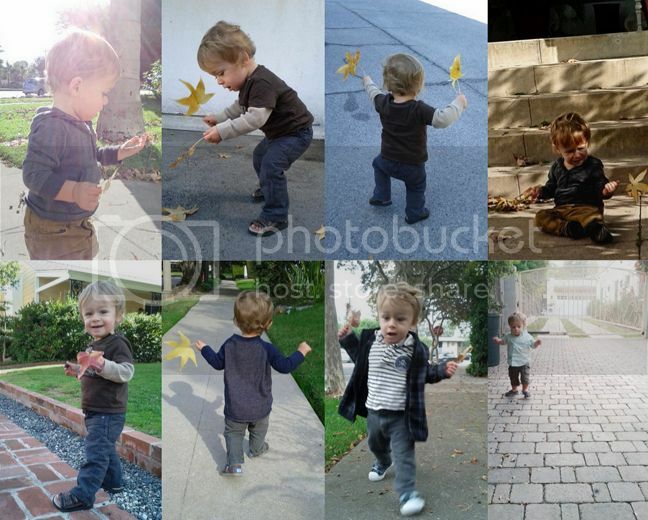 As for the leaves in each hand as he is walking...maybe he thinks he is flyings and they are his wings! I love the sweater Fox is wearing in the last picture! I want one for my 15 month old! Although it would be an inside sweater. Much too cold here to go outside without a big, winter coat. We live in Canada. This is Cindy again. We apkinda have twin lives and some friends in common. I'm so jealous that Fix is walking. Lusty is a day younger and she doesn't even seem close yet!!! P.s. that last photo of fox belongs in some name brand baby catalog! Gorgeous!